There are many fillings for phyllo pastry, both sweet or savory. While it can be challenging to work with, phyllo is a very versatile pastry. Many items made with phyllo are simple, elegant and suitable for many occasions. This type of pastry is a staple in the Greek culinary world but it is difficult to work with unless you know a few tricks. Follow these tips to ensure you get the best results. Use fresh dough if it is available; otherwise defrost it overnight in the refrigerator then allow it to sit at room temperature for two hours prior to use. Gently unroll the phyllo so that the long end is facing you. Keep the phyllo moist by draping a damp towel over it, and make sure that each time you remove a sheet you replace the towel. When baking, make sure the oven racks are in the center positions. Brush sheets of phyllo with melted butter and layer three sheets together. Fold the stack in half the long way and brush with butter. Use a pizza cutter or pastry wheel to cut your layers into strips then bake as directed. Follow the buttering, stacking and folding instructions as given above but instead of strips you will cut out squares. The size of the square depends on the muffin tin you will be using. Remove each sheet of phyllo and lay it in the cup placing each sheet on an angle until all layers are in the cup. Bake as you would the strips. You can layer a pie tin with phyllo as prepped above and bake it the same way, or you can use the phyllo to wrap a filling. If making something like a Wellington, you would cook the beef 8 minutes shy of the desired doneness, then assemble it in the pastry and bake it the rest of the way. Certain fillings can be baked the same amount of time as the pastry. Now that you know how to work with phyllo, you can fill it with many wonderful creations. What will you choose? Do you want something that is sweet or something savory? No matter which filling you choose, rest assured it will be good. Savory fillings are those that are more suitable as an entrée or an appetizer. These fillings could be suitable for either depending how you prepare the phyllo, and on the portion size. Combine the shrimp and crab in a bowl. Place remaining ingredients in a food processor and pulse until mixed well. Stir cream cheese mix with shrimp and crab. Combine all ingredients except prosciutto in a food processor until creamy then stir in prosciutto. Whip the cream cheese until soft the fold in the vegetables. While Beef Wellington most traditionally is made with puff pastry, it can be made with phyllo pastry as well. Season the beef with the salt and pepper and sear on each side. Wrap the fillet with a piece of bacon then sear the top and bottom. Place the beef in the oven at 400 degrees until 8 minutes from being finished. Saute the mushrooms with the shallots until all the liquid is evaporated then slowly add the wine allowing it to evaporate in small batches until gone. Set aside. Remove the beef from the oven. Place a spoonful of the mushrooms in the center of the pastry then top with the beef. Pull the pastry ends up and around the beef. Bake 8-10 minutes until phyllo is golden. Sweet fillings can be nearly anything you can think of and they can be as simple or complex as you like. This dessert is very simple to make and all you need is several layers of buttered phyllo and very good chocolate. Chop the chocolate into small pieces then pile into the center of the pastry. Pull up the edges of the phyllo to make a seal then bake until golden brown. Soak strawberries in 1/2 cup of balsamic vinegar. Reduce the remaining vinegar with 1 tablespoon of sugar over high heat until thickened. Add remaining sugar to cream and whisk until thick then stir in vanilla and honey. Place one strawberry in the bottom of the phyllo cup followed by whipped cream, a strawberry and a little balsamic reduction drizzled on top. Combine walnuts, sugar and ground cinnamon. Stack and butter 8 sheets of phyllo then sprinkle with 1/4 of walnut mix. 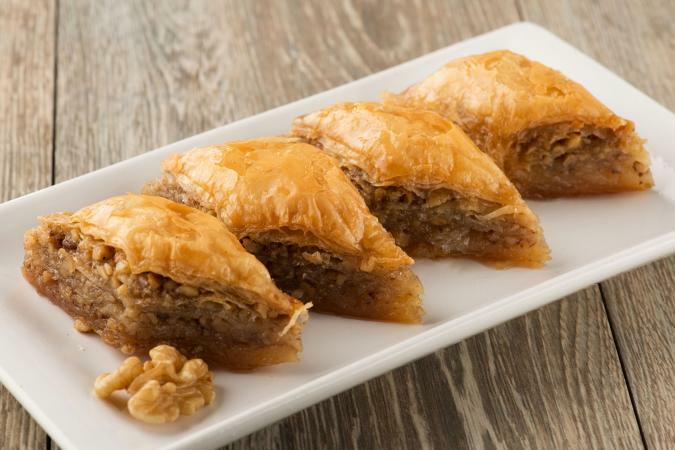 Repeat this until all phyllo is used and walnut mix is on top. Bake for 30 minutes at 390, 30 minutes at 300, 30 minutes at 210 then at 390 until walnuts are brown. Let cool in pan before pouring syrup over it. 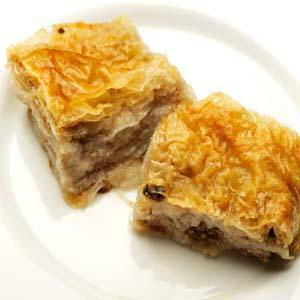 Boil sugar, water and cinnamon stick until reduced then drizzle over baklava.